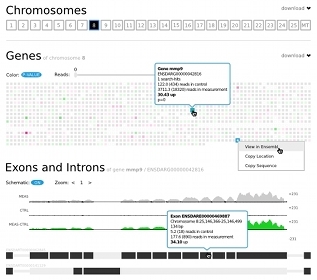 In GeneTiles the visualization and browsing of RNAseq data is greatly improved. Open source alignment and statistics programs required to map raw illumina data-files are integrated in this platform and the whole data analysis pipeline is kept open for scientific inspection and reproducibility. Differential expression of genes is shown in a 2D array of tiles. The tile color and intensity are a measure of the significance of the differential expression. When a tile is selected, the gene is loaded underneath, scaled to fit the width of the screen. In a schematic view all introns are shrunk to a fixed short length to visualize the aligned reads in a graph above the exons. 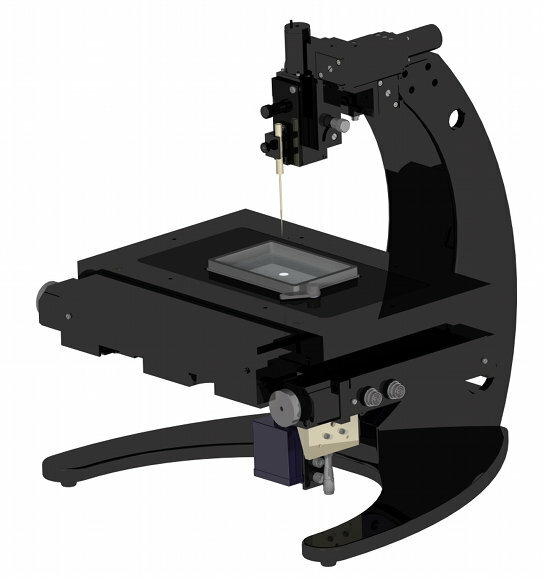 Microinjection is used for decades, however this technique has only recently been redesigned to fit the specific needs of modern high-throughput research. Using a special grid, zebrafish eggs are aligned such that microinjection can take place at an unprecedented speed of 2500 eggs per hour. Mixing polymers with a cell suspension allows for instant cell tissue creation at predefined locations in a hydrogel. High-throughput injections into the zebrafish egg's yolk are possible using the automated microinjection system. Applications comprise injections of DNA, morpholinos, bacteria, cancer cells and or fluorescent beads. Please contact for more details. By automated injection of a cell suspension derived from cell culture or primary tissue material into collagen gel with a glass pulled needle, one can obtain adhered tightly packed cell spheroids within a couple of hours. Life Science Methods BV was founded on 8-8-2011 by Jan de Sonneville. for both life sciences and medical research. Consultancy on method optimisation and pipeline development. Sold the fourth AMS to the Dasman Diabetes Institute in Kuwait.